Well, today is TCP Tuesday 194 from The Cat's Pajamas! YAY! I love hosting the challenge about once a month. Good thing, because it's my turn this week! When I host the challenge, I come at ya'll with a STAMP/DIE Challenge. This week, THE HEARTS HAVE IT!--Use any stamp along WITH any CutUps Die that have a heart to complete the challenge. 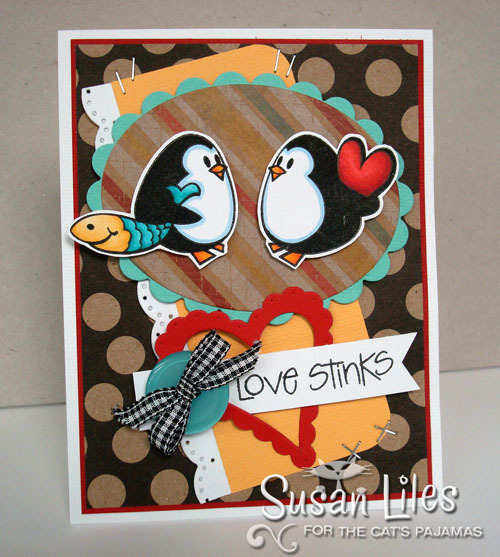 I've used the new set, Love Stinks along with the cute scalloped edge from the new CutUps die, Queen of Hearts and the older die, Heart Trio for my card today. I have to admit I went a little cray-cray with my new Tim Holtz Tiny Attacher I got for Christmas. We'd love for ya'll to play along in this week's TCP Tuesday Challenge. Well, actually we want ya'll to play every week, really. 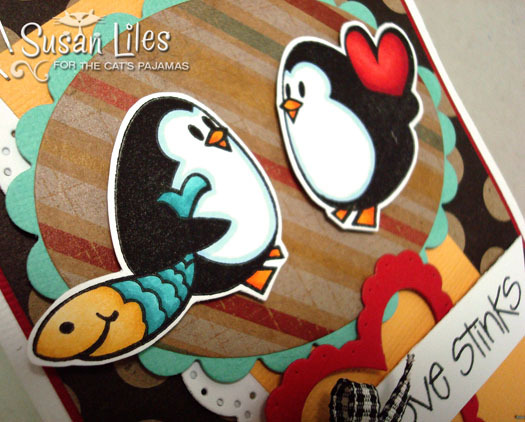 In case you're interested in being the next Swanky Stamper or winning a little Cat Cash, head on over to ALMA'S blog HERE where you'll find the 411 on all that, plus a bag of chips (links to the other Cat Packers strutting their stuff with this challenge)! SUSIE Q-TIP: If you do decide to go a little crazy with your Tim Holtz Tiny Attacher, be sure and do so before gluing down your main front panel to the base of your card. I dislike being able to see "guts" on the inside of my card, such as brad legs and staple bottoms. Don't ask me how I know this. I don't want to talk about it. love your card...great challenge for this week!